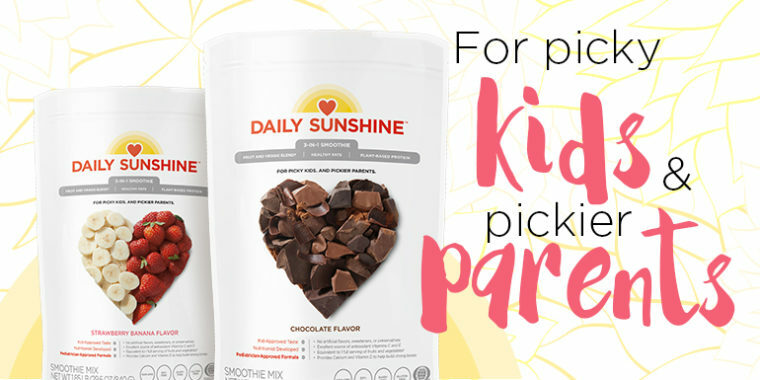 Daily Sunshine, a 3-in-1 Smoothie, Designed Just for Kids and an Adults snack too! Do they love overly processed snacks that have little to no nutritional value? Are you trying to get them on the right track with eating better but you’re sick of forcing them to eat fruits and vegetables?? Summit 2017 happened and I am so excited about the announcement of Daily Sunshine Smoothie from Beachbody. The Daily Sunshine smoothie is designed just for kids and of course adults too! I am so excited for this smoothie because of course being a clean eating family that we are, we still struggle to get our kids daily fruits and veggies in plus they just need something quick and easy to grab and go! This is perfect to make sure that they are fueled with proper nutrition each day. I couldn’t believe that all of my 3 of my kids actually requested to make their Daily Sunshine this morning when they got up, ok, the little one just followed his BIG SISTERS. Chocolate and Strawberry Banana. Each flavor is made with organic fruits and vegetables, organic pea protein, and healthy fats, and has 3 grams of fiber, probiotics, Vitamins C& E, calcium, and vitamin D. I love that Daily Sunshine is soy-free, dairy-free, gluten-free, and non- GMO, and it contains no artificial flavors, sweeteners, or preservatives. How do I make a Daily Sunshine Smoothie? All you need is one scoop of Daily Sunshine and 8 ounces of water for a smoothie. Shake well and you are ready to go with a healthy 120-calorie snack for your kids or yourself. This smoothie is made with organic fruits and vegetables, organic pea protein, healthy fats, and is a great source of calcium, Vitamin D, fiber, and antioxidants. It contains no artificial flavors or preservatives, no high-fructose corn syrup, and no fillers. Daily Sunshine is gluten-free, dairy-free, certified organic, non-GMO, and soy-free. Team Beachbody really covered all the bases with this one! I cannot tell you how many times I have been asked by customers and coaches if they can give Shakeology to their kids! While it’s not going to hurt them, it is not recommended because Shakeology was designed to fit the nutritional needs of adults. Daily Sunshine, on the other hand, was made with young, growing bodies in mind!! While they both have unique ingredients, Daily Sunshine and Shakeology contain some overlapping essential ingredients, but at different levels in order to suit the nutritional needs of kids and adults. If your kids like CHOCOLATE or STRAWBERRY quik or even “Yoo Hoo”, then they will LOVE this and you will feel great about giving it to them! And you can enjoy it as a snack too! Check out how my kids LOVED it! And they are so excited to share about this in our exclusive KIDS TEAM Challenge Tracker APP group that they have on their phones, just like MOMMY! What is the difference with Daily Sunshine vs. Shakeology? Daily Sunshine provides key nutrients in a simple yet healthy formula designed for young, growing bodies. Shakeology focuses on providing an array of exotic superfoods, adaptogens, prebiotics, digestive enzymes, and other important nutrients for adult bodies. While they both have unique ingredients, Daily Sunshine and Shakeology contain some overlapping essential ingredients, but at different levels to suit nutritional needs of kids and adults. YES! If adults like to enjoy Shakeology as a part of a healthy breakfast or as a mid-morning snack, it’s ok to treat themselves to daily sunshine as a healthy afternoon snack or late-night munchie killer. YAY! You can order Daily Sunshine here, try a Sampler Pack here, and order a Shaker Cup here! I can’t wait to hear what you guys think of the smoothies!